Notes: Based on the manga by Toume Kei. So, like, Takashiro Chizuna and Kazuna are siblings who have been raised apart since young. And they have not seen each other for, like, a really loooooong time. One day, out of curiosity (or it might be anything to keep the story moving), Kazuna decides to visit his old house and meets Chizuna unexpectedly (surprise!) and learns that their father passed away half a year ago. Thus begins the story of the strange siblings, which really should have ended five minutes ago. Chizuna: Drink my blood! You like blood don't you? Drink mine. Yaegashi & Minase: Drink OURS! Blame it on my shallowness but why they persist in isolating themselves and offering to cut themselves (ouch! ), I simply cannot understand. In this day and age, there is something known as a hospital and medical treatment. And that's that, as far the plot goes. Oh, and we should count our little blessings that this anime decides to snip any trademark tearful reunion. On one hand, the characters are annoying. But on the other, they are also the strong point of this series. Kazuna is the wishy-washy type with no idea what he wants and half the time, he has no idea what is going on. His role serves to emphasize Chizuna's manipulativeness, the puppet master, slowly but surely concluding a chapter of the story that will suit her. Chizuna gives me the creeps because she is so unfathomable. Hayashibara Megumi, playing Chizuna, has once again demonstrated her prowess as the Queen of Seiyuu. The "normal" characters bring the show back to reality. Yaegashi is the baseline where we draw comparisons and Minase has an agenda of his own. The artwork is a mixed bag. While the close-ups are good, the quality drops whenever they zoom out. The characters, especially the faces, (gasp!) lose their features and become as blank and smooth as an egg. The use of black and white for flashbacks will strike some as creative or annoy others (like me!). Music is suitable for its genre but largely forgettable. The ending was a little abrupt although the twist at the end was unexpected. But boy was I glad when the credits rolled. We all can stop agonizing and breathe a sigh of relief instead. Recommended Audience: Teens and up. Kids would be bored to tears. 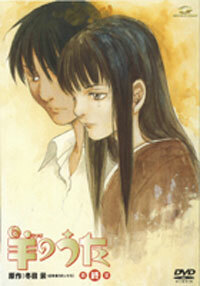 The portrayal of the relationship between Chizuna and Kazuna might be objectionable to some audience, depending on their cultural background. Rather intense adult situations from our dear Minase-sensei. I certainly didn't get the message (if any) behind this series.